Dominican Prime Minister Roosevelt Skerrit faces similar issues in his homeland; some positive, some negative. Skerrit was here in St. Vincent and the Grenadines for two days earlier this week, soliciting brokers and prospective investors for his countryâs treasury bill, which is slated to be placed on the Regional Government Securities Market on February 24. SEARCHLIGHT caught up with the 39-year-old leader and his host Dr. Gonsalves on Wednesday at CafÃ© Soleil in Kingstown, where the Dominican leader pointed out that he faces a number of challenges, similar to those of his counterpart. At the helm of the Dominican government since 2004, Skerrit said that he, too, has come under fire from opposition spokespersons, whom he said may be reading from the same script, in reference to excerpts from a judgment handed down in favour of Gonsalves against pharmacist Matthew Thomas. 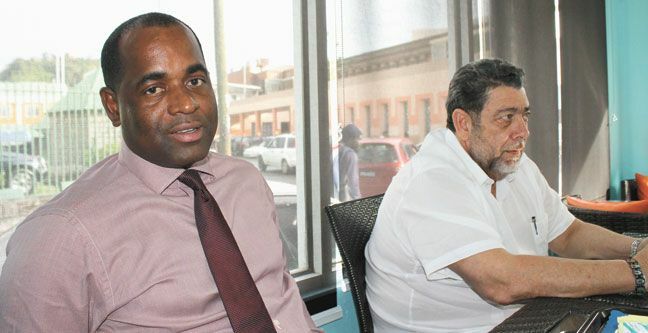 Skerrit said that he is in the process of seeking legal redress against persons whom he alleges defamed his character. âItâs the same malicious, unfounded, baseless allegations. Another issue that Skerrit pointed out that he shares with Gonslaves is the Leaderâs alignment with the regionâs sub regional organization ALBA (Bolivarian Alliance for the People of our Americas), most recently with the groupâs position on the Falkland Islands. âThe position which we took at ALBA is no different from the position which we took at the Summit of Caribbean and Latin American Countries…. People like to create this kind of foray among our people for no real reason. âThe position which we took essentially says… that both parties should meet and discuss the future of the Malvinas/ Falkland Islands. Itâs not about taking sides with the British; itâs not about taking sides with Argentineans… we are saying we are calling on the United Kingdom and we are calling on Argentina to stop taking unilateral decisions with respect to the islands which would inflame tensions, and will not result in the benefit of anybody; including those who live on the Falkland Islands. Skerrit also touched on the fact that his country will soon be addressing the issue of constructing an international airport. In the interim, he said, the existing Melville Hall facility has been upgraded. âWe have already started preparation work towards an international airport. As a matter of fact, we have solicited the services of a friendly government in the designing of international airports, and they have given us the assurance that they will assist…. So we are very optimistic with this project, and we are on our way with the dreams and aspirations of Dominicans to have an international airport. He lauded Prime Minister Gonsalves for his determination in getting this countryâs airport project off the ground, and called on Vincentians to stand in solidarity with him, with regard to the project. Skerrit indicated that he is also in support of Dr. Gonsalves on a number of matters raised, which are expected to be up for discussion when the next CARICOM Heads of Government meeting convenes in Suriname next month. âThere are some very pertinent, very fundamental issues that should be discussed at the next meeting. These are critical issues that will determine whether we move forward or we donât. Before he left the cafÃ© to visit the airport site at Argyle, Skerrit hinted that his government intends to become a shareholder in regional airline LIAT. He returned to Dominica yesterday, Thursday.